Scientists at the University of Massachusetts Amherst, in collaboration with the Vertebrate Genome Laboratory (VGL), New York, this week are publishing the first-ever whole genome for the Canada lynx (Lynx canadensis). 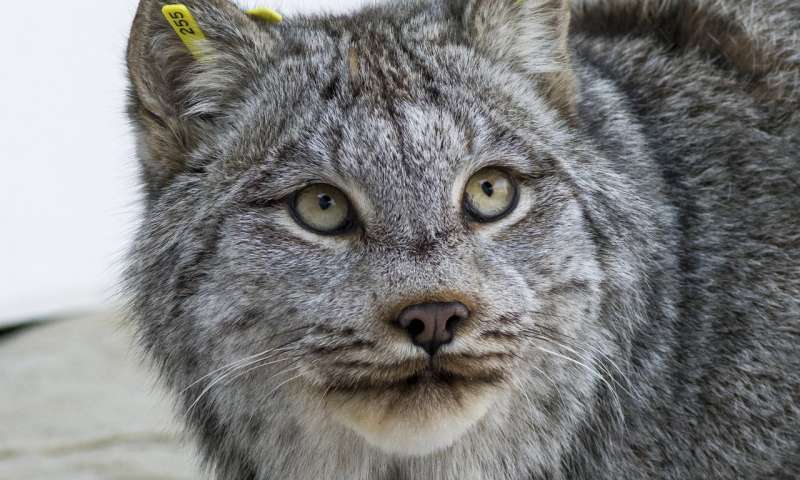 It is one of 14 being released to the public data repository for use by researchers studying evolution, disease, genetics and conservation, says lynx team coordinator Tanya Lama, a doctoral candidate in environmental conservation at UMass Amherst. The researchers will hold a press conference on Wednesday Sept. 12 at the VGL at Rockefeller University in New York to announce the genome releases. Lama, who is also affiliated with the U.S. Geological Survey's Massachusetts Cooperative Fish and Wildlife Research Unit, says that as a conservation genetics tool, the genome provides information about the genetic health, demographic and evolutionary history of the species. It also helps to describe the viability of resident animals using precise estimates of population size, gene flow and adaptive genetic variation across real-world landscapes. This information is critical to wildlife management and policy decisions, she adds. In particular, she and colleagues hope to learn more about the relationship between Maine lynx and neighboring populations in New Brunswick and Quebec, and their connections to the core lynx population in eastern Canada across "a formidable barrier," the St. Lawrence River. Lama points out, "Genetics can help us better understand the dynamics of the Maine lynx population and whether it will remain viable into the future. If populations become small and isolated, they're more vulnerable to demographic and environmental changes and are at a higher risk of becoming locally extinct." Listed as threatened in 2000 by the U.S. Fish and Wildlife Service, the Canada lynx is a North American feline native to the boreal forest across Canada and in similar habitat in the northern United States, notably Maine. A recent recommendation by the US Fish and Wildlife Service proposed delisting the lynx from Endangered Species Act protections. If delisted, a monitoring program will be developed and information on the status of the Maine lynx population and its connectivity to neighboring populations will be extremely important to developing conservation strategies. Even in recovery, Lama says lynx will require monitoring and conservation action to track climate change and habitat loss. Her co-advisors Stephen DeStefano, leader of the Massachusetts Cooperative Fish and Wildlife Research Unit and John Organ, chief of the USGS Cooperative Fish and Wildlife Research Unit Program, say the connectivity between Maine, New Brunswick and Quebec lynx populations south of the St. Lawrence is key to viability, and genomic tools can help ensure appropriate conservation measures are developed. Organ notes, "Connectivity among these populations south of the river will likely be essential to their persistence and if necessary, land conservation strategies would be designed to facilitate movement and gene flow across the landscape." For this effort, Lama coordinates a team that includes DeStefano and Organ, plus conservation geneticist Warren Johnson at the Smithsonian Institution in Washington, D.C., Jennifer Vashon and colleagues at the Maine Department of Inland Fisheries and Wildlife and bioinformatics experts at the VGL at Rockefeller University. Lama says for her, this week's public genome unveiling is not the end, but the beginning of years of analysis to follow. 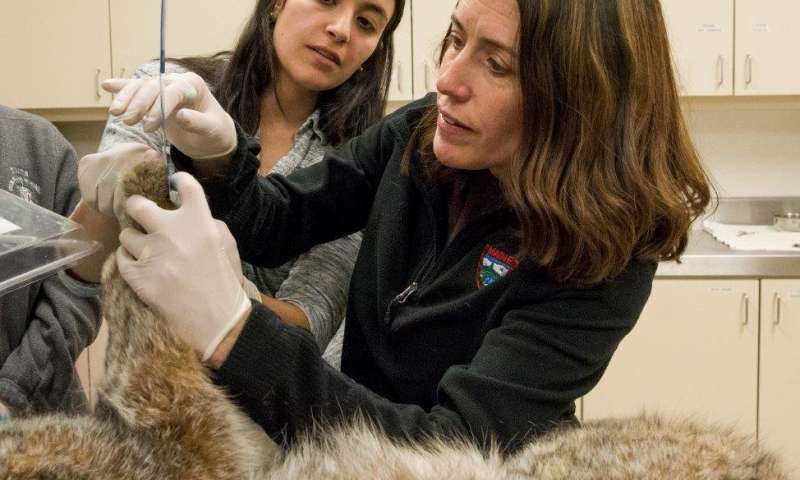 As conservation geneticists, she and Johnson at the Smithsonian will analyze data, produce reports and interpret findings that will be of great use to conservation teams across the rest of the lynx's distribution in Minnesota, Montana/Northeastern Idaho, Washington, the Greater Yellowstone area and Colorado. Johnson says that a visible and iconic species like the lynx "provides a great opportunity to explore the complex biological, ecological interactions among species and the natural environment and serves as a great model for using genomic approaches to inform our decisions." DeStefano adds, "Anytime we can get more information on their population fitness, we'll take it. A lot of conservationists are deeply interested in the future of this beautiful cat," he notes.